It's starting to get chilly out there! We've had a few days with flurries lately, so a huge snowstorm can't be far behind. This sweater is one of my favorites, and it's from the men's department! Last year on a trip to Marshalls I wandered over to the men's section and saw a chunky purple sweater. Since purple is my favorite color I decided to pull it out, turns out it was MARC JACOBS and a size Small, I could totally wear that, although it would be over-sized. I am constantly wearing this sweater because it is so warm and cozy! So, there you have it ladies, just because it's labeled "men" doesn't mean you can't wear it. I also buy the men's tshirts from Everlane just because I like a longer sleeve and looser fit. It was flurrying a bit while I was taking these pictures. Good thing these boots have a weather-appropriate bottom! I actually wore them last year after a huge snowstorm and they were almost better than my snow boots. I have quite a few pieces in my closet that I snagged from the men's section...I usually always do a quick sweep of the men's section when I walk into a store! I love me a super-chunky sweater. This one is a fab find in the men's department! I am also a fan of shopping in the mens department!! Always a a better fit for things like sweaters, and this one looks amazing on you! 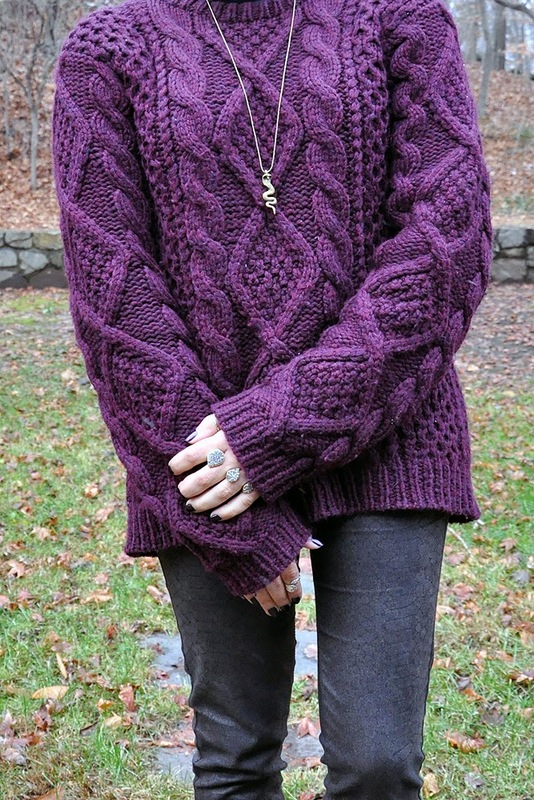 Oh, I love the oversized knit pattern and of course the rich color is gorgeous on you. I doubt I would have even guessed that was from the mens department if you hadn't mentioned it! It looks especially cozy and warm! I totally agree - you should never trust labels: gender or size because you've got to try it on. I usually go to fat children's clothing section, I have found interesting pieces there.